Canada’s Immigration starts with an application for a Canada Immigration (Permanent Resident) Visa. The applicant should meet certain eligibility criteria outlined in the Immigration and Refugee Protection Act. There are several categories of Canadian immigration under which a person can apply to immigrate to Canada. These categories are federal skilled worker, Business class category, family sponsorship and other temporary visas to study and work in Canada. We offer a wide range of Canada’s immigration services in Canada and outside of Canada. Based on the information provided to us, we will assess, advice, and assist you in preparing and filing application for permanent resident under the skilled worker and business class category. We also provide services to help you sponsor your family members through the family sponsorship visa application. The skilled worker visa holders of Canada are permitted to permanently reside, work and study in Canada in any of the ten provinces or three territories of Canada. Holding this visa confers permanent resident status on the applicant who will enjoy same rights and privilege as those of a Canadian citizen with a few exceptions. If you wish to start or invest in a Canadian business, business class visa is the right choice. Business Class visa encourages applicants to immigrate and invest in Canada. The family class visa permits qualifying Canadians citizens and permanent residents to sponsor their family members residing outside Canada. It allows reuniting the families in Canada. The Student Visa allows foreign students to study at one of Canada’s schools or universities. A Work Permit allows the applicants to enter Canada to work temporarily. Temporary Work Permits can help towards permanent immigration to Canada. The Canadian Visitor Visa is intended for people who want to visit Canada for a short time. Some visitors may need a Temporary Resident Visa. If you are qualified and eligible to provide care giving services to children, elders, and disabled people, we can help you to immigrate to Canada in this category. You will be issued a work permit and based on your status while working in Canada you can apply to become Permanent Resident. Are you interested in knowing more as to which category is more suitable to your situation? Please feel free to call us for guidance, we will make sure you are moving towards right direction. 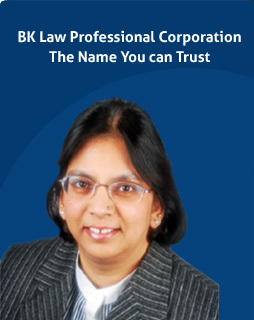 Please download the Immigration Evaluation form and send it to Balvinder Kumar (balvinder@bklaw.ca). In case of any questions, please call us at 905.290.7205 and we will be happy to assist you.